LAS VEGAS (January 17, 2019) - Before they enter the ring on the undercard of this Saturday’s Pacquiao vs. Broner SHOWTIME PPV® event at the MGM Grand Garden Arena, fighters competing in PPV action squared-off against their opponents at the final press conference Thursday in Las Vegas. 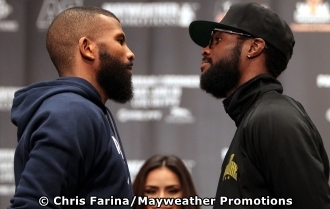 The press conference saw a stare down and some verbal sparring between former two-division world champion Badou Jack and unbeaten contender Marcus Browne as they near their battle for the WBA Interim Light Heavyweight Title. The event also featured former champion Rau’shee Warren and unbeaten Nordine Oubaali, who battle for the vacant WBC Bantamweight World Championship, and WBC Interim Featherweight Champion Jhack Tepora and former champion Hugo Ruiz, who compete in a 12-round attraction that opens the PPV at 9 p.m. ET/6 p.m. PT. In the main event, Senator Manny "Pacman" Pacquiao, boxing's only eight-division world champion, will end his two-year hiatus from a U.S. boxing ring when he returns to Las Vegas to defend his World Boxing Association Welterweight World Title against former four-division world champion and must-see attraction Adrien "The Problem" Broner. “We had a great camp. As usual, I’ve been in the gym training hard. It’s nothing new to me. I’m on weight and I’m full of energy. I feel blessed. “Marcus Browne is a young up-and-coming guy. You have to respect everyone who steps into the ring. I’m ready for this challenge. “On paper Marcus Browne isn’t on the level with the guys who I’ve fought. Who knows? He might be a great champion. But either way, I’m focused on what’s in front of me. If he doesn’t respect this challenge, that might be his downfall. “Everybody opponent has talked about me and said I’m a basic fighter, but after the fight, they have excuses. I don’t want to hear any excuses after Saturday. “If Marcus Browne really believes that this is his time, then that will bring the best out of me. I’m not a trash talker, but I’m extremely motivated now. I hope he comes to fight. My prediction is to win and dominate. “Marcus has never been in this position so I think he’s a little nervous or he doesn’t know how to act. He’s disrespecting world champions and he’s never even won a title. “My team has sacrificed their holiday to grind it out with me in camp and It’s got me ready for Saturday night. I’m in the best shape of my life physically, spiritually and mentally. “I have respect for Badou Jack for stepping up to the plate and giving me this opportunity. In boxing you have to fight the guys who are hungry for opportunities and I’m that guy. “I’m not trying to disrespect anyone he’s fought, but I feel like he hasn’t fought top level guys since moving up to this division. I’m young and hungry and I’m ready to go. I’m a different animal than what he’s seen. “I’m ready man. I’m focused, I’m hungry, I’m ready to get in there, weigh in and do what I have to do. I’m tired of talking. I’ve been put on hold a couple times, but I’m prepared for this moment right now. “Badou is a strong, smart-headed as a fighter and just disciplined. A win over Badou would give me the respect that I deserve. But I gotta win first, and that’s what I’m here to do. “I had a wonderful training camp. There’s nothing like fighting someone you lost to in the Olympics. I know Roy Jones Jr. felt like that when he got cheated in the Olympics. In this rematch, It’s going to be a way different fight. “I’ve been in camp for about three months. My coach has seen me overcome different situations in training. I had the toughest sparring I’ve ever had in camp and I want to thank them for getting me to this point. “Oubaali hasn’t fought anyone like me. Getting in the ring with me is a whole different story than when we met the first time. It’s an honor to get my revenge. “I’m a different fighter from when I fought for the title the first time. In this fight I’ve picked up something different, which is my jab. I feel like I’m going to control the whole fight with my jab, my speed and my timing. “I’m doing this for everyone who supports me and helped me to this moment. Saturday is a big fight for me to get my first world title. “To have this fight in Las Vegas makes me very happy. This is the fight capital of the world and it makes it an even more special moment to be here. “I fought Rau’shee Warren in the amateurs, but I know in the pros it’s totally different. I know that I have progressed even more since I turned pro and am better than when we fought in the Olympics. “Rau’shee is a good, smart and slick fighter, but I have the strategy for this win. I have the power that he lacks. I’m going to accomplish my American dream. “I’m ready for this fight and I’m thankful to Manny Pacquiao and my team for making this happen. I wish my opponent good luck and I’ll see you in the ring Saturday. “I’m just excited for Saturday night and I can’t wait to step into the ring and show the world my abilities and what I can do. “I’m very emotional and I’m thankful for everyone who helped me get this opportunity. My team is a family and we’re here to take advantage of this opportunity. “I have a big responsibility to come and put on a good fight for everyone in the arena and watching on SHOWTIME and all over the world. “I’m tall enough and strong enough for this weight class and I’m coming to get another knockout on Saturday. I’m more experienced than Tepora and I believe that I know how to start fast and break my opponent down. “This is a terrific undercard. I’ve promoted 14 PPV fights over the last 12 years, and hands down this is the best undercard thus far. It’s just a great night from top to bottom. 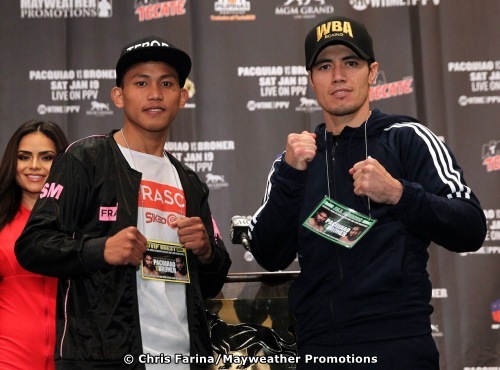 “Tepora vs. Ruiz will certainly be an all-action fight to open the telecast. Rau’shee Warren will enter trained by the renowned team of Barry Hunter and Patrice Harris, while Oubaali has the legend Roy Jones Jr. in his corner. I believe this all adds up to a war on Saturday. “The co-main event could possible steal the show. 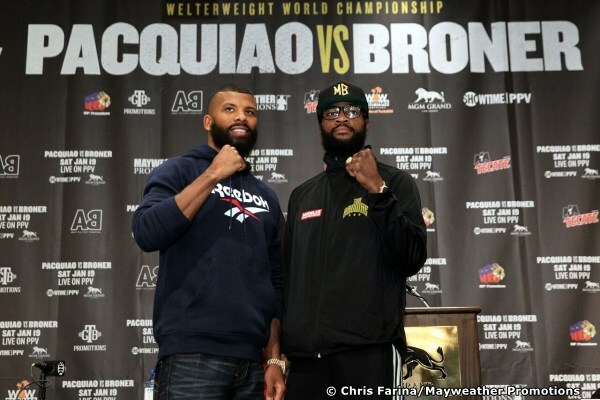 Mayweather Promotions’ own Badou Jack will be taking on Marcus Browne, who’s a great fighter that is very hungry. Marcus feels like this is his time and he feels he’s going to prove it on Saturday. “The combined record of these six fighters is 134 wins against just seven losses. You don’t see that level of quality top to bottom very often. These are also exciting all-action affairs. “Tepora is coming off six straight knockouts, and 11 knockdowns in those fights. He’s looking to keep that streak going. If you’ve seen Hugo Ruiz fight, you’ve probably seen him in a Fight of the Year candidate, because that’s what he does. 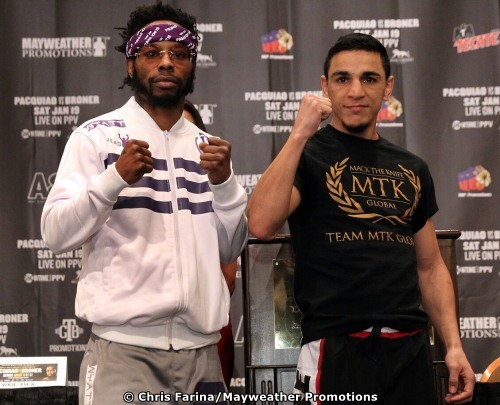 “Rau’shee Warren and Nordine Oubaali are fighting in an Olympic rematch. Rau’shee is another fighter with high-quality fights on his resume, and Oubaali is aggressive himself, with five straight knockouts. “Badou Jack vs. Marcus Browne is a matchup of two top-10 light heavyweights who were homegrown on SHOWTIME. This is Badou’s 13th appearance and Marcus 8th appearance on the network. Badou has one of the strongest resumes in boxing and is one of the underappreciated stars in the sport. He’s facing another great fighter in Marcus Browne, who’s looking to keep his unbeaten streak alive. Pacquiao vs. Broner is headlined by Senator Manny "Pacman" Pacquiao, boxing's only eight-division world champion, ending his two-year hiatus from a U.S. boxing ring to defend his World Boxing Association Welterweight World Title against former four-division world champion and must-see attraction Adrien "The Problem" Broner Saturday, January 19 in the main event of a SHOWTIME PPV® event from the MGM Grand Garden Arena in Las Vegas. For more information visit www.sho.com/sports and www.mgmgrand.com, follow on Twitter @MannyPacquiao, @AdrienBroner, @ShowtimeBoxing, @SHOSports, @MayweatherPromo, @TGBPromotions, @MGMGrand and @Swanson_Comm or become a fan on Facebook at www.Facebook.com/SHOSports, www.facebook.com/MayweatherPromotions and www.Facebook.com/MGMGrand.